The United States is pretty much the perfect country to road trip in, with great roads, cheap gas and hundreds of gorgeous destinations to choose from. It’s no wonder that a California road trip is on many visitors to-do lists! We’ve taken a number of fantastic US road trips, including Route 66, the Pacific Coast Highway, the Oregon Trail and a route through the Deep South, and have never failed to have a fantastic time. 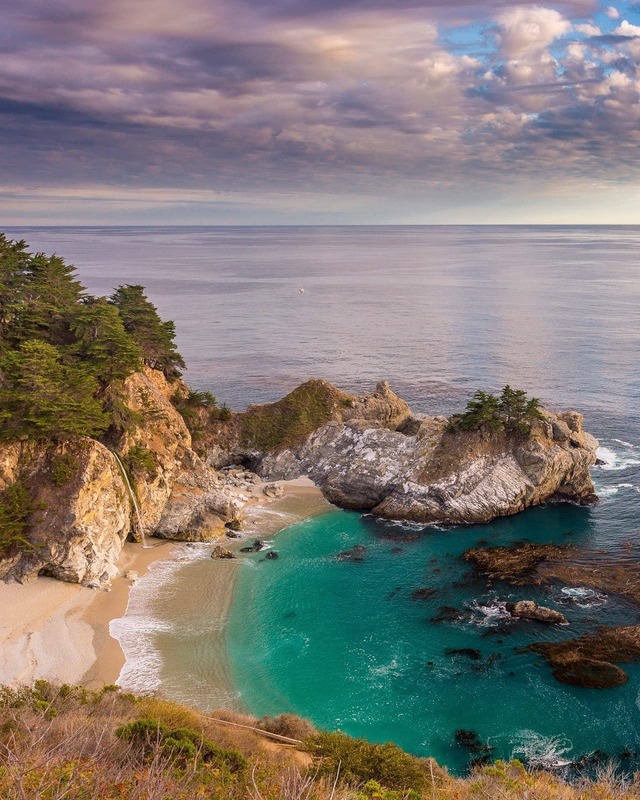 One of our favourite states to explore though has to be California. 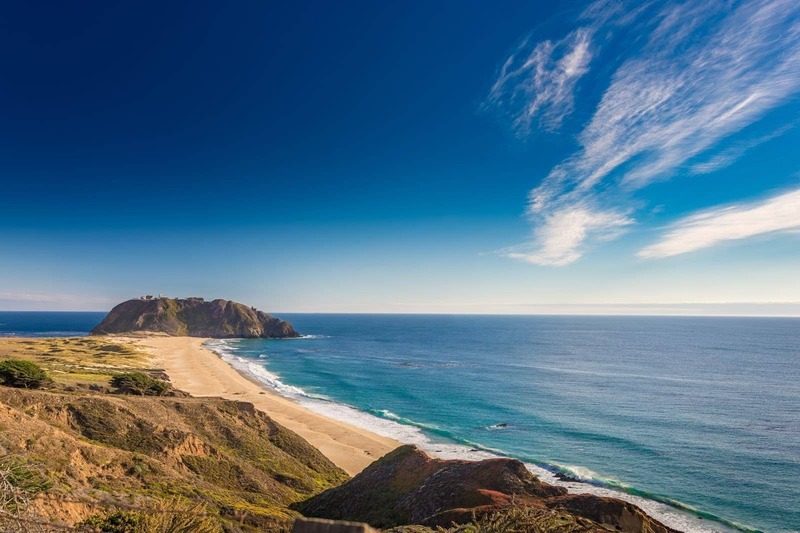 With a mix of an excellent climate, some of the best National Parks in the country, and world famous cities to explore, you’re never going to run short of things to do in California. 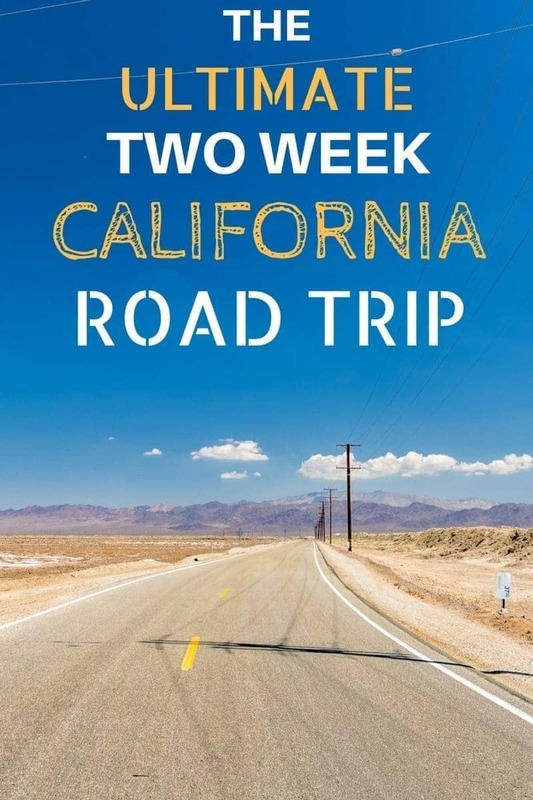 With this in mind, I wanted to put together a classic two week California road trip itinerary, taking in some of the best that the sunshine state has to offer. I did a trip almost exactly the same as this a few years back, so I know that it’s a good one. Two weeks is also a good amount of time for a trip like this, although you could of course extend it by a few days if you wanted to see a bit more, or wanted to go a bit slower. This California road trip itinerary has you starting and finishing in San Francisco. However, as it’s a loop, you could also start and finish at any other point, although LA would be the most logical. The route also runs anti-clockwise, but you are welcome to drive it in whichever direction you prefer! We’re going to start with San Francisco. It’s home to the second largest airport in California, so there are plenty of opportunities for getting here for both domestic and international travellers. San Francisco, and the surrounding San Francisco Bay Area is also an excellent city to base yourself for your first three days. If you’re arriving internationally, you’re going to want a few days to adjust to the time zone difference before hopping into a car, so I’m going to recommend spending three nights in San Francisco, and picking up your hire car as you leave – you won’t want (or need!) a car while you’re in the city. You won’t be short on things to do in San Francisco, and in fact, might feel a little overwhelmed by all the choices! Our suggestions would be to take in the Golden Gate bridge (hire a bike to get here easily), explore Chinatown, pop across to Alcatraz, revel in the tourist trap that is Fisherman’s Wharf, don’t miss golden gate park, head to the top of Nob Hill for cocktails at The Mark, hop on a cable car and, if you still have time, take a stroll at Lands End. To get yourself oriented, we can also recommend taking a walking tour with the excellent SFNative folks, they know the city backwards and their pints and politics walking tour in particular is fantastic. Finally, if you’re looking for some great photo opportunities, check out our guide to the best photography locations in San Francisco. Accommodation wise, there are plenty of options in San Francisco. We’ve stayed at and are happy to recommend the Hotel Rex, which was perfectly located within walking distance of everything we wanted to see, offering a good balance of comfort and price. 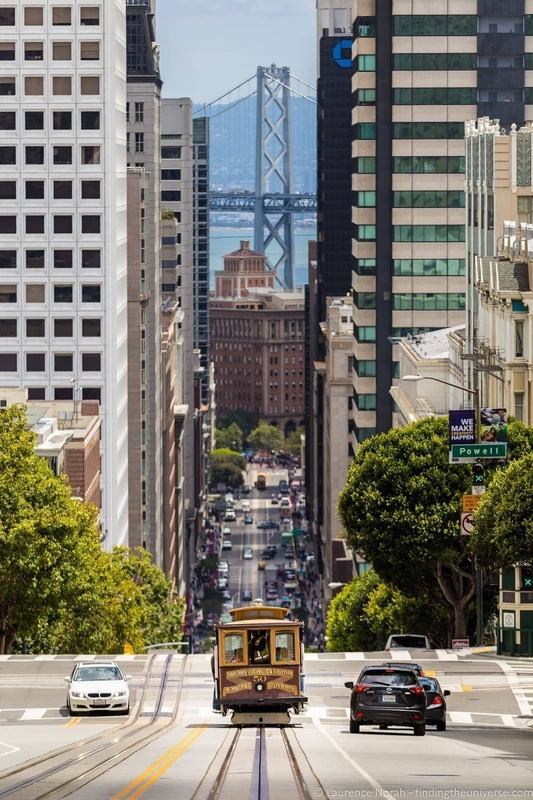 See more options for hotels in San Francisco here. The drive down the section of the Pacific Coast Highway from San Francisco to Los Angeles is definitely one of the best road trips in the world. So it’s really a no-brainer that this would be your first destination after you pick up your hire car and head out of the city. There are numerous highlights along the way, from cute seaside towns to gorgeous wilderness areas. Don’t miss Santa Cruz, Monterey, Big Sur and the Julia Pfeffer Burns State Park (camp here if you can!). The latter is particularly famous for the waterfall that cascades onto the beach, a gorgeous photo opportunity. 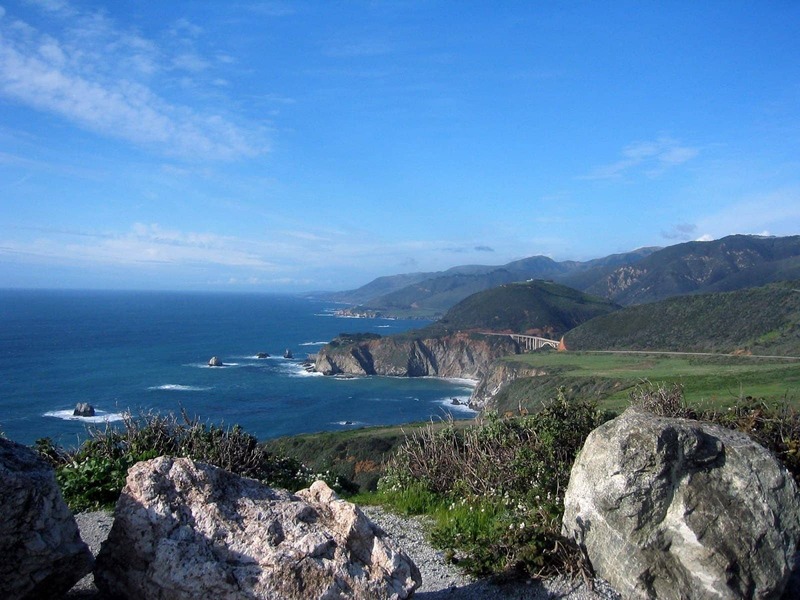 From Big Sur head further south and take in highlights like the seals at Cambria, tasty food at San Luis Obispo, the gorgeous Pismo beach, Hearst Castle and more. 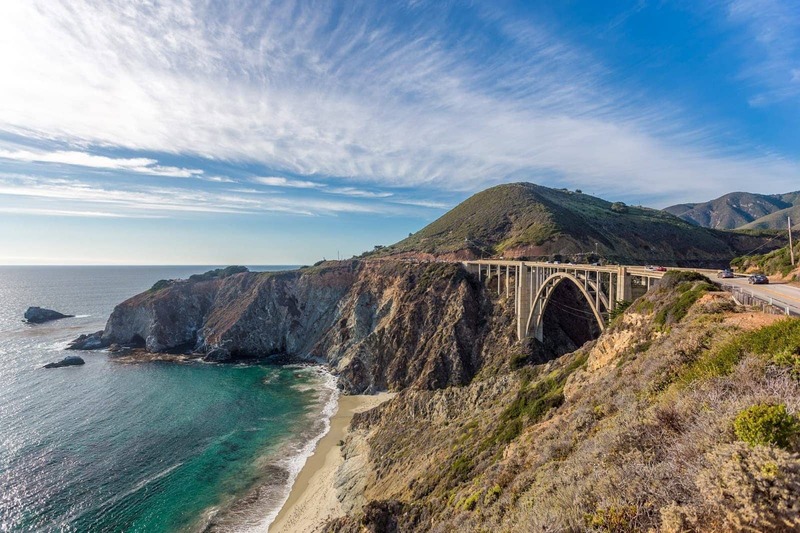 For loads more information on this stretch of highway and to help you plan the perfect coastal road trip, check out our super detailed guide to planning a Pacific Coast Highway road trip. There are plenty of accommodation options all the way down this stretch of highway, from campsites and B&B’s to luxury hotels – it all depends on your budget and what you’re aiming for. Los Angeles can be a big, confusing place, particularly after your trip down the Pacific Coast Highway. 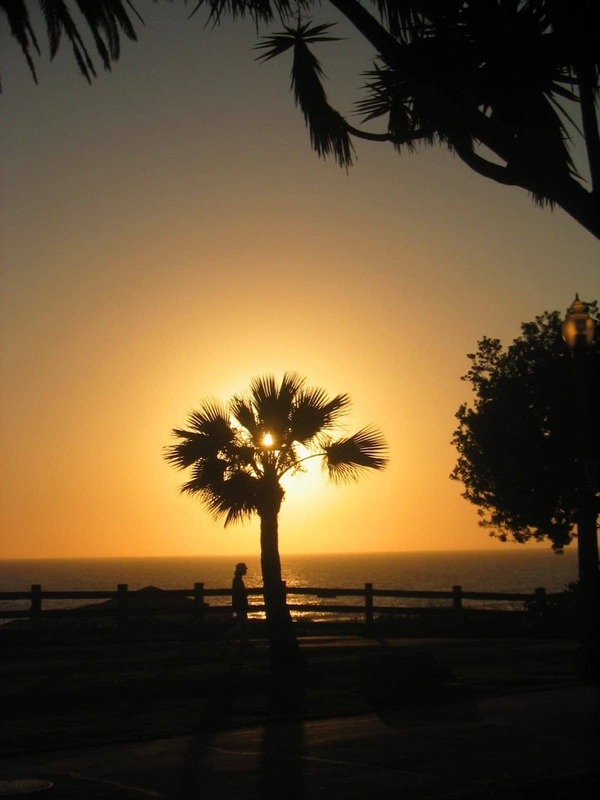 That’s why I suggest you head to Santa Monica and make that your LA base. On the coast, and technically a separate city (it’s kind of hard to tell as LA and its surrounds are part of a fairly vast urban sprawl), you’ll have access to the wonderful beach and pier, as well as nearby Venice, most famous for its beach and people watching opportunities. Again, there’s no shortage of things to do in LA. If you’re interested in film, you can visit the Hollywood sign, walk the Hollywood walk of fame or go on a tour of the backlot at Universal Studios. Art lovers will find their thrills at the Getty Center, which also offers gorgeous panoramic views of the surrounding city. Other highlights include Sunset Boulevard, and of course, you can hop on one of those tours of the stars homes if you’re so inclined. LA also has plentiful accommodation options to suit all budget – check out listings here for inspiration. If you’re not excited about Los Angeles, you could also choose to skip it and head down the coast to San Diego County and the city of San Diego itself. This is a more laid back (and easily navigable!) experience compared to LA, and there’s a great deal to do here as well. For more reading on San Diego, check out this awesome San Diego guide. Time to head out of the city, and the remainder of this itinerary is going to focus on exploring some of California’s unbelievable wilderness areas and National Parks. 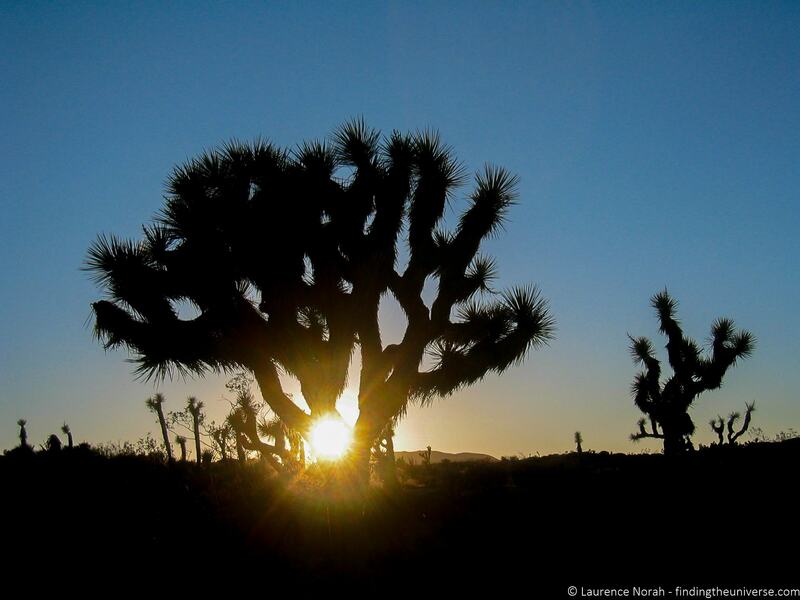 We’re going to start this off with a trip to the Joshua Tree National Park, home to those iconic shaped trees that the park is named for. It’s a wonderful place, the meeting point of two deserts, and offers good opportunities for camping, hiking and star-gazing. The best way to experience the park is to camp overnight in one of its many campgrounds (you should definitely reserve a spot well in advance if this is your plan), otherwise, there are various lodging opportunities outside the park if you’re not big into camping. You should also be aware that there is very limited water availability in the park (and no hookups for RV’s), so make sure you bring plenty of water and food – this is a remote desert environment after all! Moving on from one desert environment to another desert environment – and the largest national park in the contiguous United States. Death Valley (the name was given by gold rush travellers who nearly perished here) is the hottest and driest place in North America, and has recorded the hottest ambient air temperature in the world. So, overall, a hot place. Other than making you want to crank up the AC then, what does Death Valley offer? Well, there’s that sense of remoteness. The vast, unforgiving wilderness. The knowledge that you’d probably die fairly quickly if you happen to wander off and get lost (don’t wander off and get lost folks). Truth be told, there’s plenty to do here. 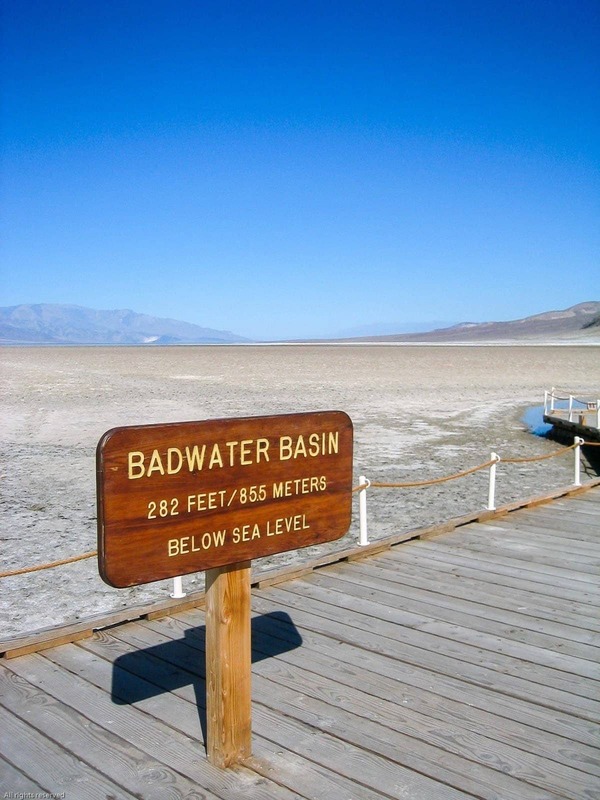 You can visit Badwater Basin, the lowest point in the entire North America, which actually sits 86 metres below sea level. Then there are sand dunes, salt flats, craters, colourful canyons and hiking opportunities galore. Just be aware that this is a seriously inhospitable, and, in the summer months, unbearably hot, destination, so plan and pack accordingly. 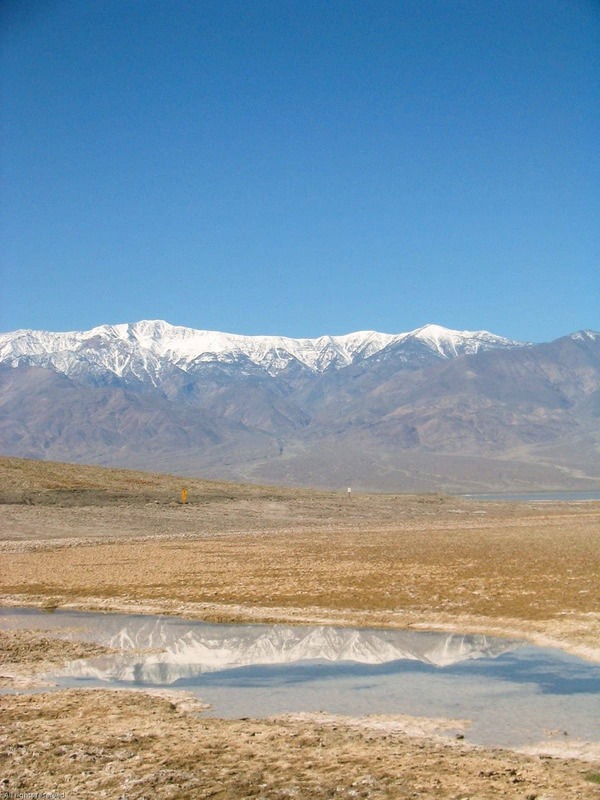 If you’re looking for more ideas on spending a day in Death Valley, check out this excellent post. From Death Valley we’re going to head further north, up to Mammoth Lakes. This drive is quite incredible, along the Sierra Nevada mountains, and the scenery (and temperatures) will change dramatically as you ascend into this gorgeous part of the world. Mammoth Lakes are an adventure lovers playground. You can go hiking, camping, cycling, rock climbing, horseback riding, fishing – the list goes on! There’s also a ghost town, craft beer companies, shopping opportunities – basically, pretty much everything you could imagine. Whilst you’re here, you should also take the opportunity to visit Lake Mono. 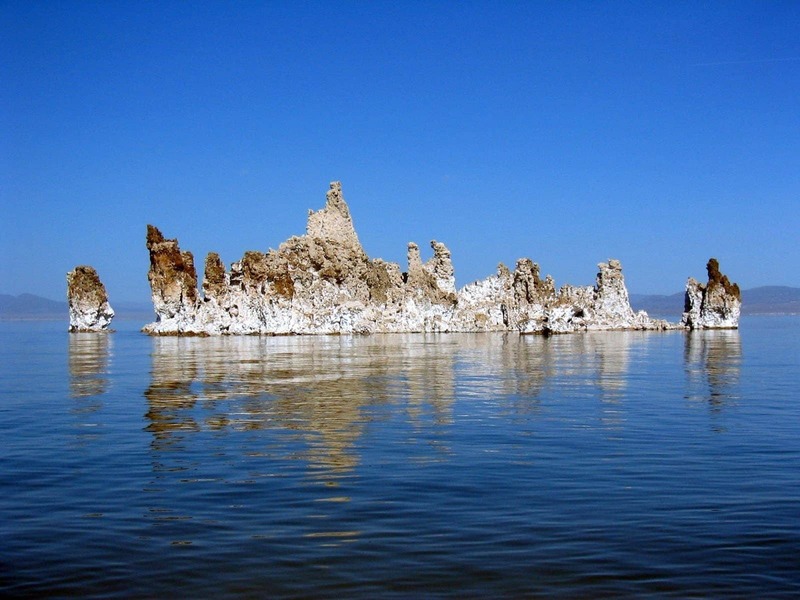 Now a state nature reserve, Lake Mono is a million year old lake notable for the “tufa” towers, calcium carbonate structures that stand above the lake like strange modern art installations. Definitely worth a visit, and particularly photogenic at sunrise and sunset. Finally on our awesome California road trip, I’m going to suggest you spend three days exploring Yosemite National Park before heading back to San Francisco to return your hire vehicle and head home. Yosemite is without doubt one of my favourite places in the entire United States. It’s a wonder of nature, a photographer’s paradise, and somewhere I dare anyone to visit without falling instantly in love. There’s a lot to see and do here, which is why I’m going to suggest taking three days to get the most out of your visit. This will let you see all the highlights, as well as go for some longer hikes (or drives), and not feel too rushed. 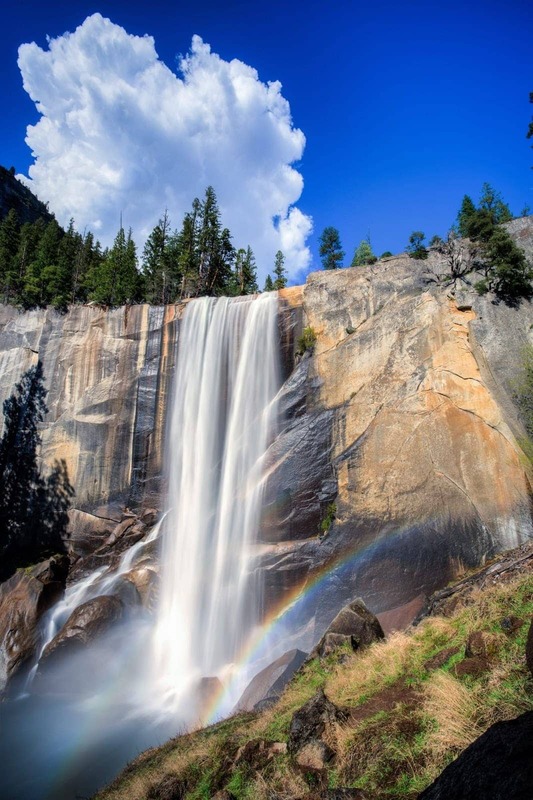 I’ve got a full guide to the best photography locations in Yosemite, but in brief, don’t miss Yosemite Falls, the hike up to Nevada and Vernal Falls, the drive (or hike) to Glacier Point, Tunnel View, Valley View and Bridalveil Falls. If you love longer, more challenging day hikes, then Half Dome is a seriously challenging walk (permit required), as is the walk up to the top of Yosemite Falls. 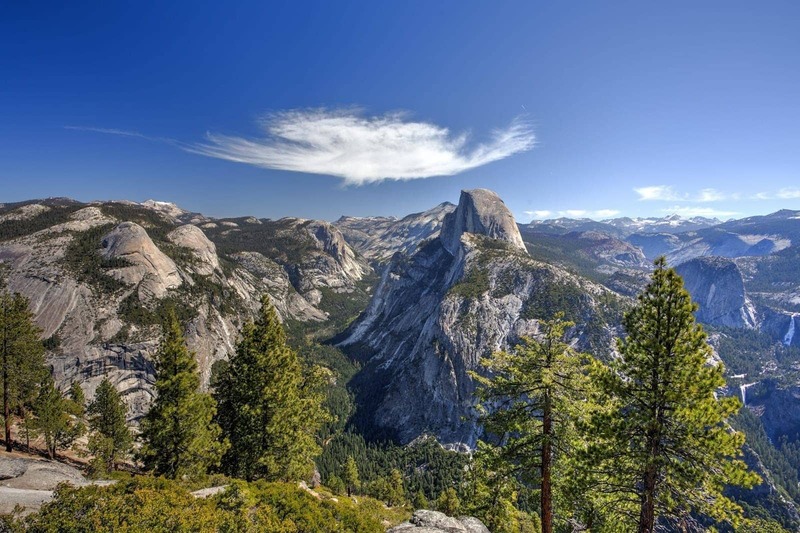 Yosemite National Park has a wide range of accommodation options, from bring your own camping through to luxury hotels. Be aware that spots book up fast, particularly in summer months and at weekends, so book well in advance to avoid disappointment. 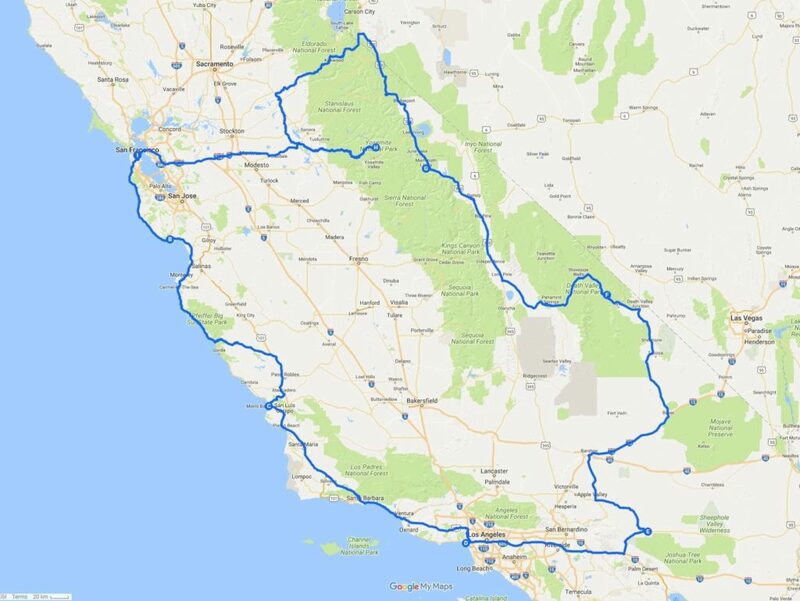 We’ve put together a map of the our suggested California road trip itinerary, which you can see below, and also on Google Maps here. Note that depending on the time of year, access to Yosemite can be restricted due to snow, so you have to take the longer way round. In addition, parts of the Pacific Coast Highway are often closed due to damage caused by landslides, and this map shows a route around the most common area affected by landslides. This route reopened after 18 months of closure towards the end of July 2018, so you can now follow the coastal route again, however, I’ve left the map as it is to show you the detour should landslides happen in this area again. You can check the status of the coast route (state highway 1), as well as all the other roads in the state, on the Caltrans website here. California is a fairly good year round destination, but there are a few things to be aware of when planning your trip. In the Winter months, places like Yosemite can become accessible particularly from the east side, due to snow, as you can see in the map above. The main road in to Yosemite is the Tioga Road, and this is usually closed from November through to May or even June. In addition, parts of the park, including Glacier Point road, are often closed for a similar timeframe. If this happens to you, you’ll have to take a serious detour to get in based on this itinerary. A better option might be to embrace the snow, and head up to Lake Tahoe for some fantastic skiing opportunities. Or, you can head east, out to Nevada and the pleasure city of Las Vegas. 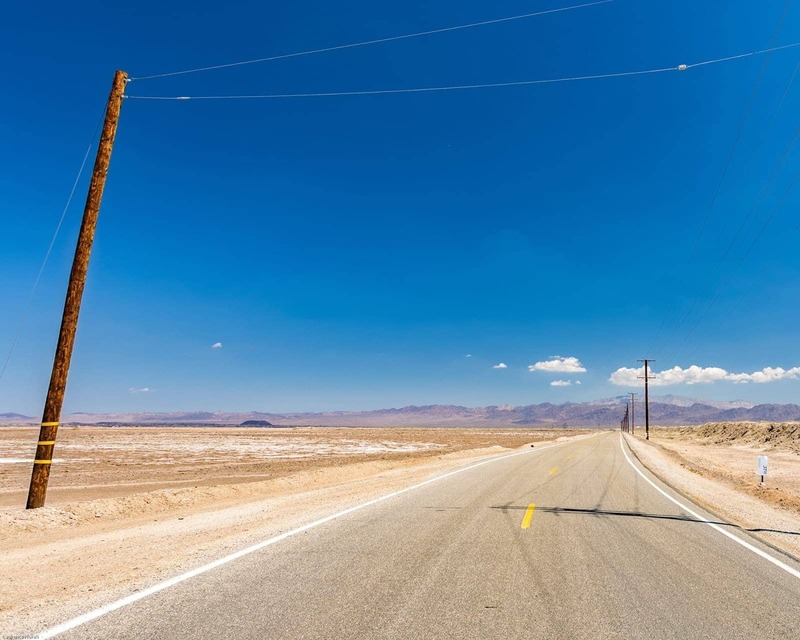 In summertime, the heat can be quite intense, in particular in places like Death Valley, where in the summer months temperatures can exceed 100F, and it’s not recommended to spend much time outside. California has a serious range of accommodation options to meet pretty much every budget, although larger cities and busier months do tend to increase the prices. We’d always recommend booking in advance for your trip if possible – in particular for national park campsites and hotels, and to get the best deals on city centre hotels. For two people travelling together, you’re looking at a budget range of $60 – $150 per night for comfortable private en-suite accommodation, although you can obviously spend far more than that! Our preferred option for hotel booking is booking.com, as they usually have the best prices, regularly run deals, and many properties offer good last minute cancellation policies. See their listings for California, San Francisco and Los Angeles to get you started. We also use and recommend AirBnB for apartment rentals and staying with locals. If you’ve not used them before, you can get up to $100 in travel credit (depending on the deal at the time) when you sign up with this link. For more ideas, take a look at our travel resources page for helpful hints and tips on getting the best deal on accommodation when you travel. This is a road trip, so obviously you’re going to want a hire a car! We nearly always hire cars for our US road trips through Enterprise. We generally find they have the most competitive prices and widest choice of locations, plus if you’re thinking of a one way trip they have reasonable fees for doing that. Drivers with foreign licenses are allowed to drive, if your license is in a language other than English then you would be best with either an international drivers license, or a certified translation. Another option of course is to hire a camper van or RV, which will let you stay in campgrounds and other, more out of the way areas. This can be a fun way to travel in a more self sufficient style. If this sounds like you, check out Outdoorsy, who offer peer to peer campervan rental – a bit like the AirBnB of RV rental! If this is your first time in the USA, or you just want a reminder of what it’s like to drive in the USA, check out our guide to driving in the USA for lots of tips! Travelling in the USA is relatively easy, but we wanted to share a few things to help make planning your California road trip a little easier. The USA uses a 110v electrical system, with plugs that are either two pin or three pin. The holes are flat, and sometimes the two pin plug holes will be different sizes, so the plug will only go in one way. If you’re coming from much of the rest of the world, including Europe, the UK or Asia, you will definitely need a travel adaptor like this. You will also need to check that your equipment supports the 110v supply, as much of the rest of the world uses a 220v supply. In our experience, most electronics like laptops and phone chargers accept a universal voltage, whilst higher power devices like hairdryers do not. Always check the device itself, the voltage rating should be on your plug or adaptor somewhere. Internet access is widely available across the USA in the form of WiFi, which can be found for free at most hotels, cafes, bars and restaurants. There are also a number of free WiFi hotspots in some of the cities on our list. If you want data as you travel, you have a few options. Travellers from Europe on the Three network can use their data to roam, for example, at no extra charge. This is a great option for travellers, and we can recommend picking up a Three pay as you go SIM for travel use. Alternatively, if your phone is unlocked you can pick up a pay as you go SIM in the USA. One of the better options is from Straight Talk, which you can buy in Walmart stores. The USA uses the US dollar, and there are ATM’s available throughout. In our experience though, you can pay for nearly everything with a credit card, so you will rarely need cash. Whilst it is worth having a few bills on you, for the most part you won’t need them. Instead, just make sure you have a credit or debit card that doesn’t charge you any foreign transaction fees and uses a fair price for currency conversions, and you should be good to go. Water across the USA is safe to drink, unless otherwise indicated. There are drinking fountains in the majority of public locations, and we recommend you travel with a re-usable water bottle so you can just fill it up as you go. One thing we always love about travelling in the USA is how drinking water is always brought to your table at a restaurant – something we wish was standard around the world! For the most part, the USA is a safe destination to travel in, and we have never had any problems. Of course, every country has crime, and areas where you would be wiser to avoid, however if you practice basic safety precautions, keep your valuables out of sight and behave as you would at home, you should be fine! I’ve written a guide featuring some of my top tips for driving in the USA to help get you going on the road! Wondering how much a California road trip will cost? Check out our guide to how much it costs to travel in the USA to help you plan your trip budget. A US road atlas, because sometimes you don’t want to rely on GPS! And if you’re looking for inspiration for the rest of the USA, check out our USA section, which includes a Deep south itinerary, tips for New Orleans during Mardi Gras – and lots more! And that sums up my perfect two week California road trip itinerary! If you’ve got any comments, suggestions or additions, do pop them in the comments below. Plus, if you liked this post, do check out the rest of my itinerary series, which will help you plan the perfect trips all around the world! Hi guys, great post. I found it really handy now as i’m planning a 3 week road trip through California (and Nevada) in a month (apr 6 to 27). We are starting in LA, just a few days and then planning to go to Joshua Tree (Mojave, is it worth it? ), Las vegas, Grand Canyon, Death Valley, Yosemite, San Francisco, and Route 1 back to LA. It’s quite a lot of days, and i find hard to plan where to sleep every night, as i’m not sure how long would it take me to visit every national park, and even cities. So my question is, should i book in advance all different accomodation? In that case how many days should we give to the different national parks and places. As the trip gets so long, we are being really careful with our budget, and that takes me to the second question, what are the best places to stay on a budget in the different stops? By the way, we are a group of four, planning to rent a car. Thanks again for your post. Looking forward to read your answer! So to answer your questions. I think Mojave is worth it if you like deserts and wide open spaces. In terms of accommodation, you are not travelling at a very busy time of year, although it is easter towards the end of April. However there are no Federal holiday, so it should not be too busy. So this means you should be able to book quite last minute. The only places I would advise maybe booking in advance would be any national parks you want to stay in, which can be busy year round. So Yosemite, Grand Canyon and Death Valley, if you plan on staying inside the park, you will want to plan your accommodation in advance. In terms of budget accommodation, the parks all have campsites, so that would likely be the cheapest option if you don’t mind camping. Some have existing tents you can hire if you don’t want to bring your own tent – Yosemite for example has some nice fixed tents which are not too expensive. For other cities, I’d advise looking at the budget motel chains like Motel 6, Red Roof Inn and so on. These can be very cheap, but do be aware they are not always very central. So you might find something like AirBnB to be more cost effective. As you are visiting a number of parks you will probably want to buy a national parks pass, which will save you money on parks entry. I would take extra care with possessions in the big cities in California. I left my purse in the back of my rental car, parked in a highly visible location on a beach in San Francisco, and even though there were people walking up and down the beach, the window was smashed and the purse stolen. Luckily wallet & phone were on me and the purse was even found and turned in to the police, but I had to exchange the rental car. Other than that California is awesome. Sorry to hear that Cris! This is definitely an issue around the world, we always recommend not leaving any valuables in sight in a car as it makes for a tempting option for a thief 🙁 Glad to hear you got your purse back though! Fabulous site guys… I would love some tips please my husband and I are planning a once in a lifetime trip to the USA, we fly into and out of Los Angeles , arriving 16th October and leaving 5th December. We will be spending thanksgiving with friends in Washington state . We would like to drive the Pacific highway, see some of LA, San Fran , Yosemite,Death Valley Las Vegas,- just very quick as we feel we should see it and the Grand Canyon . We love nature, beautiful landscapes, we are also foodies . Any suggestions would be very welcome , hire car v Rv , obviously due to the length of our trip I would like to be sensible on accommodation costs…is there a reliable decent hotel/motel chain you would recommend, or Airbnb. I have also been looking a5 the trusted Housesitters website but have recently come across a few very negative reviews . Thanks so much! We’ll do our best to help out. Where we have loads of posts that you will find useful. Most particularly, I’d advise reading our driving in the USA, and our guide to how much it costs to travel in the USA. That latter one in particular will help you in terms of costing out the trip. For a hire car, a normal car rental is going to be a lot cheaper than an RV, especially as you will most likely still have to rent campsite space to stay at. A standard hire car in the US will usually start at around $200 a week. Our US travel budget post has a lot more on how to find the best deal and things to watch out for. In terms of accommodation, the US has a wide range of options. The cheaper chains include: Red Roof Inn, Motel 6, Super 8, America’s Best Value Inn, Travelodge. The next step up would be Comfort Inn and Holiday Inn. Note that the cheaper hotels are often found a little way outside of towns, often at interstate exit ramps. It’s also worth being aware that they are nearly all franchises, and so as a result the quality can vary dramatically, so it’s always worth reading reviews before visiting. For booking and reviews, we highly recommend Booking.com. We have nearly always found this to be the cheapest option, even compared to turning up at the property, and the reviews can be a helpful guide. However, just bear in mind that cheaper hotels tend to rate worse, as folks can have high expectations! Hopefully all this helps, let us know if you have any more specific questions we can help with! PS We are also planning to visit family in LA and have possible access to accommodation in Pacific Grove so should we be considering finding snow at Big Sur instead of north of San Fran? PPS Budget is going to be very tight! So I’ll answer the Big Sur question first 🙂 Snow isn’t very common at Big Sur as it’s right by the sea, and it doesn’t usually get much except at higher elevations. The most reliable option is to head east to Tahoe or Yosemite, although that is going to be quite a drive and won’t fall into the definition of a short drive I’m afraid 🙁 The other option is to head up towards Auburn, as you get closer to the Sierra Nevada Mountains you will definitely find snow, but again, this isn’t going to be a short drive. Whilst there is always a possibility of snow elsewhere, I wouldn’t want to guarantee it! In terms of house swaps, the closest option we have for you is TrustedHousesitters, but that’s more of a house sitting opportunity than a home swap. I know there are home swapping platforms, but we’re not familiar with them, so I wouldn’t want to give a recommendation! Thanks for the super-prompt response! Very helpful to know Big Sur is unlikely to tick the box and we hadn’t considered Auburn so I’ll find out more about that instead. Otherwise we’ll stick to Yosemite or Tahoe, which we’ve heard lots about. Also, I know real snow is ideally preferable, but there are a number of locations that generate snow that are going to be closer to San Francisco. If you google “snow in san francisco” or something similar, you should find some options! Thrilled to find your fascinating and helpful site! We live in Cape Town, and are planning a month in California between Thanksgiving and Christmas this year, focussed around spending time with family in San Fran. But my 14- and 16-year-olds have never experienced snow so we’re looking for guaranteed on-the-ground snow in early/mid December, as short a drive from SF as possible. Skiing not required, but snowman-building and perhaps some sledging would be great. Also, can you recommend a site we might arrange a house swap through? Hi, I’d like to know if February os a good time to make this travel. And what do you think about Sequoia National park? Hi there! 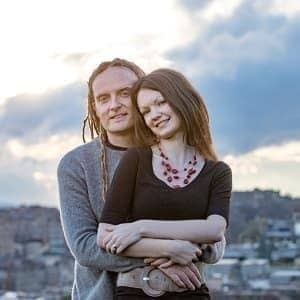 This post has been really helpful as my partner and I are planning our honeymoon for April 2019 and we would love to roadtrip in the US. We have about 12 nights and would love to spend good chunks of time in San Francisco, LA or Santa Monica and some national parks. We would also love to do the Pacific Coast. We were originally thinking of flying into San Francisco and out of LA, but your post has me wondering if a roundtrip is better. Would you suggest we amend your suggested route? Which of the the national parks would be the best to visit? Hi! I love your blog guys! We are thinking about a road trip in California next summer, and this post is a perfect inspiration! We will travel with our kids, they will be 3 and 6 and we have 3 weeks instead of 2. Do you have suggestions on how/where to use the extra days? Considering we can’t plan super long tiring car journeys and have to incorporate some activities they would enjoy too like some beach life, aquariums… Any suggestion is very welcomed! Thank you very much in advance! So my suggestion would be to follow this itinerary, but just to go a bit slower and spend a bit more time in each place. I’d definitely suggest the Monterey Bay Aquarium and the San Diego Zoo as two great options along the way, and Universal Studios in LA is also sure to be a hit 🙂 Along the PCH you’ll also find loads of lovely beaches, so I think you’ll easily be able to stretch this two week road trip into a three week California itinerary! Have an awesome time! Hi Im planning a road trip with my family to California from Orlando,Fl on June 2019. I want some advice where should we start. Hi, my partner and me are planning to do a road trip next September 2019, starting from San Fran and heading south, eventually arriving in San Diego over a 2 week period. Can you recommend a good car hire company, how long before we should book and some nice places to stop with boutique hotels, This will be out first time in America and I’m completely at a loss where to start planning. It looks like you are doing a one-way trip, so just bear in mind that sometimes the “meta-search” tools that search a variety of providers don’t always account for that. So it might be easier to go direct. We’ve found that it really varies, but we’ve often had success with Enterprise and Hertz. It’s also worth bearing in mind that pick up from an airport location is nearly always more expensive than a city location, so if you can be flexible in that regard you will likely save a bit of money. Especially somewhere like San Francisco, as you don’t really need the car for the city and it will just end up costing you in car parking fees and wasted rental fees for a car you aren’t using. In terms of other things to think about, I’m not sure which country you are coming from, but definitely consider getting a travel credit card that won’t charge you for foreign transaction fees, and maybe a SIM card that offers roaming in the USA. Three in the UK has a pretty good deal for SIM cards that offer free data in the USA. This is a great read, thank you for sharing. My partner and I are looking to do a similar trip in October this year. However, we are slightly confused on the route (and in what order) to do it all in. We want to do 14 nights and start in San Francisco and either end in San Diego or Vegas. (Everyone says Vegas is a must see at least once and although not on the top of our list, we thought we could add it on the end). Our initial thoughts are 3 nights in San Fran, 2 in Yosemite, 1 in Monterey, 1 in Santa Barbara. 3 in la, 2 in San Diego and 2 in Vegas. Does this sound too ambitious? And any thoughts on in what order we would do this? I would appreciate anyones input on this. Thank you in advance! My pleasure. So the only slight niggle in your itinerary is that Yosemite is the opposite direction to the Pacific Coast Highway, so that will add a bit of driving time to your route (it’s about 3 – 4 hours each way from San Francisco). I definitely recommend Yosemite, it’s just going to take a bit of time to do it on this trip. Overall your route is certainly do-able, as long as you don’t mind a fair bit of driving. I like that you are scheduling multiple nights in the various locations, that will give you more time to enjoy without rushing. I’d say that your order is pretty good, I can’t think of a better way to do it. Thank you for taking the time reply! I am glad it sounds doable. I think the multiple stops should help to break up the drive (I won’t be doing it my other half has that pleasurable job =) ). Yes Yosemite is the one we are are a bit confused about as when to add it. Before or after San Fran and at what point as you say it is out of the way, but is a must for us, and we don’t want to miss anything on the drive down from San Fran to La, so a tricky one. Thank you for your input, much appreciated! Hi there, my wife and I are coming mid October to California for a road trip celebrating my 50th. We start in SF, only for 2 days, then have 3 days before we get to Yosemite. Have you any recommendations of where to visit in that time, we don’t mind going in any direction before heading towards Yosemite? We then head to Las Vegas for my actual birthday for 3 days then onto LA for a further 4 days, any suggestions of where to spend time between the cities? Hope this helps a bit! Have a great trip and happy birthday! Absolutely loved your article. We are a group of 6 friends that are coming from Trinidad and want to stay about 7-8 days on a road trip starting in LA and possibly leaving from San Fran. We are coming around the end of Feb 2019 and leaving around March 6 or 7th. Still in the planning stages and would appreciate any advice or recommendations. I want to include Yosemite and Sequoia but don”t know if it is feasible with the time period we are looking at. Any advice would greatly be appreciated. Take care. Thanks very much. So Yosemite would be feasible, but you have to bear in mind that in February and March it can still be quite snowy in the park, and it’s also a four hour drive each way from San Francisco, so that’s going to eat up a lot of your time. My suggestion would be to definitely do the Pacific Coast Highway over two or three days, and then depending on your interests, either some time in places like the Joshua Tree, or the cities like LA, San Francisco or San Diego. 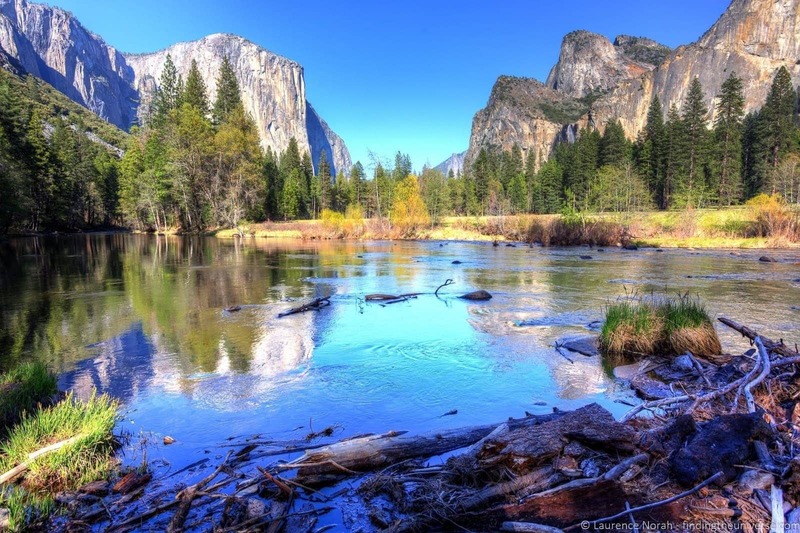 Another option is to go further north of San Francisco, although Yosemite is a really incredible place and well worth the effort to get out there! Hi Laurence, We are a family of 5 holidaying in California in August and staying San Francisco (3 nights) -Yosemite (3 nights)-Monterey (2 nights)-Santa Barbara (1 night) and at the moment San Diego (2 nights) and LA (3 nights). I am wondering if we are being over ambitious at the end of the holiday and should just stay in LA rather than driving down to San Diego and back to LA for our flight back? Is San Diego a must see? I am torn between wanting to see it all while we are in California but not overdoing it and rushing too much. What are the travel times likely to be realistically between Santa Barbara, LA and San Diego at that time of year? Thank you for any advice. Great website! We are booking a 3 week trip over Christmas. LA to San Francisco, via Vegas/Death Valley etc. Weather wise, what should we expect, particularly with Yosemite? Is there anywhere along the coast which is worth stopping off between LA and San Francisco for a night? 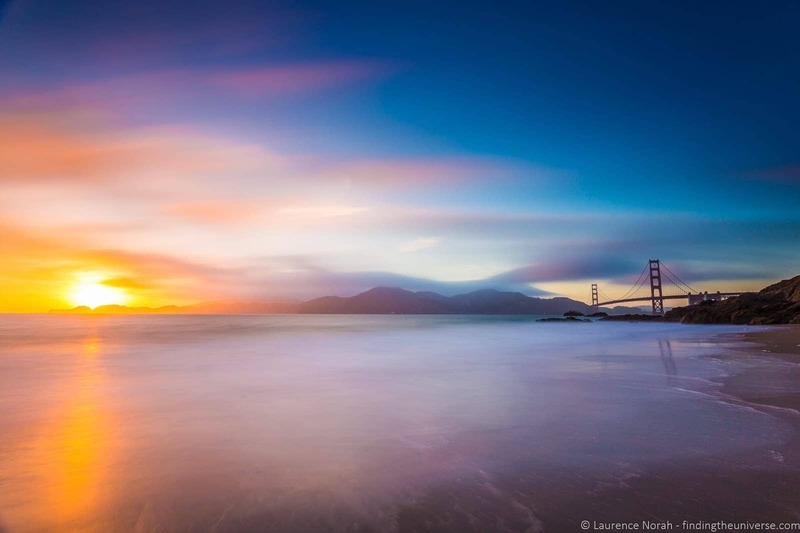 Hi Laurence, great post and photos! My husband and I are planing to do 2 weeks driving trip in California, i love all your suggested destinations, I may do the same trip as yours. However, I will be 4 months pregnant (planning to go in May) during the trip, may I know if the in-land route/parks and lake visits are suitable for me and accessible by car or light walking/ light hiking? your trip is start from san francisco and end there too, am i right? thanks in advance! Hi Lis! Thanks very much 😀 The trip does start and end in San Francisco yep. This looks like a great route, but I was really hoping to see Sequoia National Park. Any advice? Hi Theresa! Thanks very much! As that’s in the north, you’d want to add it on near San Francisco. So you could either spend less time in the city, or lose a day somewhere else on the route. It’s hard to give specific advice without knowing your exact interests, but as you sound like you prefer nature to cities, perhaps spending less time in the cities might work better for you? Have a great trip! Thanks for your reply. Sequoia National Park is south of Yosemite on the map (Redwood National Park is north of San Francisco). It doesn’t appear that there is road access to Sequoia NP on your route which heads north on 395. I did more research and verified that is the case. Hi Lawrence , we are also considering tyis roadtrip this month. Were from Canada. Assuming we are on the road a giving day with no reservations for a room the same night , by what time do we need to confirm a room or is there plenty of options once arriving early evening. Thank for everything. Hi Jacques! At this time of year for the most part you shouldn’t have too much trouble finding a room at the last minute. It does depend a little on what level of accommodation you are after, but for quick and easy motels we found they had lots of availability in general. We do definitely advise always checking prices online somewhere like booking.com though, as we nearly always got better deals that way compared to turning up – often the person at the desk didn’t have the power to actually match a price. So do keep that in mind 🙂 Have a great trip, and let me know how it goes! Hi Lawrence ! We decided to take two weeks to travel from San Francisco to LA (Manhattan Beach) . We travel along the coast for these 14 days and enjoyed it tremendously. Next trip will be the National Parks . We are hoping to do everything in your itinerary plus San Diego, we will only have 15 nights and would like to spend at least 2 full days in San Diego and 2 full days in SF, do you think this is reasonable without spending too long out of the 15 days in the car? I think that should be do-able yes, if you are focused and don’t get too distracted 😉 Have an awesome trip! Hi! I am planning a trip with my 10 year old son and love the looks of your itinerary. What would you suggest budget wise for this trip (minus flights) for the two of us? Thank you — what a great and helpful site you have made.We are flying into San francisco from Australia in April.We only have 10 nights.Your suggestions are great — we will miss the LA part.Happy for anyone hear to put in their opinions for an itinerary!We will spent 4 or 5 nights in San fran and 3 in yosemite but the 3 nights are up for grabs –we have done Big Sir before so probs wont go south on the coast.I am thinking maybe Lake tahoe,gold rush towns …love to walk,history, beautiful scenery and quaint American towns.Happy to drive long distances– thank you –your photos are wonderful! Our pleasure – thanks for commenting to let us know, it’s always appreciated. Sounds like you have some good plans already – one idea might be to head north for Shasta Cascade region and see the caves / redwoods. I have a post about that region on the site too 🙂 Have a fabulous trip! Thank for that .I will look into it a bit more — I am really impressed with your links for such like 12 best spots for photographing San Fran or Yosemite. So helpful to know where to go to get those great shots! We are planning two weeks but thinking of hiring an RV instead of hotels, what do you think? An RV is definitely a good idea, but do be aware that they can be pricey, and you often have to pay for camping on top of that as well – although there are a lot of places you can camp for free in the US! So really it’s up to you – we’ve done both, and RV’ing is definitely a lot of fun! Thanks for pointing this out. Do you know how long the road will be closed? I’ll put a note in the post. This is some great advice for our upcoming trip. We have almost three weeks out in CA and these will be some great spots! Traveling with an 8 and 10 year old this still seems doable! So many good ideas here, and I agree that visitors should plan at least 3 days in San Francisco and Yosemite. One suggestion I’d make related to the “when to visit CA” section–SF and much of the coast are cold and foggy in the summer, so it’s a good idea for visitors to dress in layers and expect lots of fog in summer, that way they won’t be disappointed! Wow this is so exhaustive!! I’ve don’t the pch before and it’s a dream. I would also definitely recommend staying in Santa Barbara – and the Mexican street food!!! Thanks Sarah! It’s a fun place to road trip for sure – thanks for the recommendation!